Question 7- Let‘s talk about CHILDREN. When couples get married, the one expectation that is always at hand is looking forward to start a family together. The idea of never conceiving is always not on anyone’s mind. We too didn’t think that we would find ourselves in that quandary, but we did. We looked forward to start a family, but the wait took longer than we anticipated. Every month, I looked forward to having a double line on my test-kit but nothing worked. …When it did, they all ended up as usual. I took my folic, I took my pregnancy care pills, I had numerous injections that made me sick, and fatigued, we tried it all. No one prepares you enough for that curve ball – save for the communication you both had prior to settling down. That’s why I insist, talk and talk aloud now. Nothing can prepare you enough for a miscarriage, or recurrent miscarriages for that matter. Nothing can prepare you enough for the endless hormonal therapies, the numerous pills and countess injections that one has to endure when trying to conceive. The questions from the older women and your peers are overwhelming. The situation is itself perplexing to both of you. The pressure is enough to spin you off. Its simply a Gordian knot! I had women advising me on why I should give birth before 30. I had others castigating me – saying that i simply didn’t want to disfigure myself. I had Christian friends talk ill behind my back, i had others who rejoiced over our recurrent miscarriages. It’s never an easy journey, and giving up is always an easier option than waiting. The pressure can tear you both apart if you don’t talk and discuss that situation prior to settling down and in marriage too. We leaned on each other, reminding each other of what we had talked about before we settled. Oh yes and God gave us a burden for marriages that are in these current generation, and beyond ours too. Our focus changed from being “baby fixated” to fixing our eyes completely on THE LORD and to each other. Any waiting womb will tell you how many times they have had to cry themselves to sleep, begging the Lord to take away that bitter cup. All in all, His time, God’s time is the best. He comes and wipes all your tears away. Children will come, in God’s time! Enjoy the wife of your youth. Enjoy your husband. Work on having a firm foundation that when your kids look at you, they truly will know the definition of love. Work on loving your wife, so that your daughter will see the definition of love from you. Not the “love” that a man tries to show her by simply wanting to get in between her legs! Strength is in understanding that we are unique, gifted with individual strengths, and each one of us has a role and a place in marriage. You can’t be her and she can’t be you. At the end of the day, you will have to chose your place! Work on loving your wife, that your son will see the true definition of a real man. A man who is faithful to one wife, devoted and true to please only her. A man who is responsible, hands-on, supportive, loving and the priest of the family. Work on loving your husband, giving him the space to be the man of the house, respecting him, commending him, that your son will not seek out a sugar mammy who shows him that being loved is having to be “smothered.” – a love that doesn’t ground! Work on loving each other, and your children will know the true definition of submitting to each other in respect, love and taking individual responsibilities. So before making a deeper commitment, and getting engaged to each other, talk about having children or lack thereof. How it will affect you and consequently your marriage in future. Are children important to both of you? On a scale of one to ten, how important are they to have? What will happen if you don’t conceive? Will he succumb to the pressure of having children and dump you for another woman? Will he shield you from his family and will you shield him from the pressure that emanates from family members? Would you consider IVF or adoption or will you be both comfortable with your temporal set-back? Suppose you have kids, will you be patient enough to learn them and lead them? How will kids play a part in your marriage? What will be the place of the children in your marriage? Don’t assume that they will bond you two. Sometimes children test the same marriage you quickly rushed into. They will test your patience, your love for each other, your commitment to each other and to your vows. Kids will automatically reshuffle your program in every way. So how will both of you maintain your marriage, and just not a marriage, but a stupendous marriage, balance work, career, individual hobbies and interests, ministry, friends, fun and at the same time love your kids immeasurably? What about the pregnancy process, will he help you around? How will you discipline your children? Will both of you discipline them? What will your individual roles be? How will you show your affection to your children? How will family time be with the children? How often? Will you allow them to have phones, electronic gadgets etc? How knotted should you be when it comes to sticking to one decision that should be followed by your children? What do you define as respect when it comes to your children? Which schools will you take your kids to? Don’t assume that you will both want them to attend private schools. I have come across couples who have divergent views when it comes to schooling their children. Some view private schools as “spoon-feeding schools”, others view public schools as “street schools.” Others prefer homeschooling. 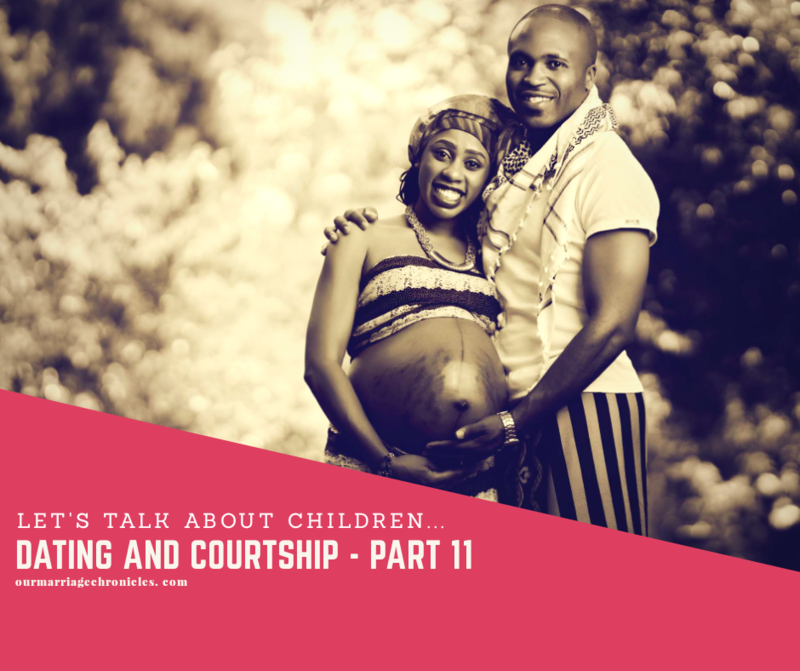 Don’t assume that the “love feeling” will be enough to jump over the hurdle that will present itself when you both have different views on where your kids should school at. Talk about it now, if you both decide to “amend your constitution” later, well, that’s good. Ask all these and more before you proceed o further with your relationship.